Ralf Daniel’s family lives in a far-flung community in Samar, in the eastern part of Visayas island, Philippines. His parents are separated so he and his siblings, Hannah and Bryan, live with his father, Randy, and grandparents Gellie and Rodulfo. Since they live in an agricultural community, the family primarily depends on Randy’s farming income. But last June 2011, a flood brought major agricultural damage decreasing farm productivity. Most of the farmers anticipated a bountiful harvest but the flood toppled most of the crops. Facing this dire circumstance, Randy had a hard time keeping up with the family’s needs. Grandma Gellie was forced to help Randy do farm labour to earn additional income. 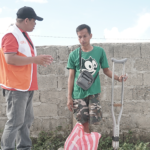 “Instead of taking care of my husband Rudolfo, Ralf’s Daniel grandpa, who’s suffering from a stroke, I needed to go out to the field with Randy,” Gellie shares. Rice and vegetable gardening have been the family’s source of income. From their P200 ($4.35) average daily earning, grandma Gellie put aside P150 ($3.26) for food and 50 ($1.1) for the kids’ school expenses. However, the crops were terribly devastated by the flood. “Before the typhoon came in, we would often have a staple fare of fried or stew fish and green vegetables,” Ralf Daniel shares. “However, some days after the flood, we ate lugaw (rice gruel) or fried rice every morning until lunch,” he adds. To tighten their budget, grandma Gellie learned to boil bananas and camote (sweet potato) sometimes. “I was asking God to provide us food on our table. I didn’t want my family to be hungry,” Ralf Daniel says. 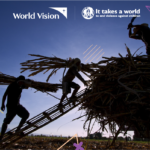 Moreover, Ralf Daniel was given the opportunity to represent their region and join the annual National Children’s Congress organised by World Vision. “It was very timely. The theme of the congress was about climate change and environmental protection,” Ralf Daniel adds. The session on climate change aimed to form young environmental champions, children who understand why trees have to be protected, why water and electricity use has to be moderated, and why mindless waste disposal is a threat to health and survival. Just how well the kids understood the changes in their environment were shown by what they wrote and drew at the end of session. “In my notebook, I drew trees because they prevent flooding,” Ralf Daniel shares. “Much had been said about how trees provide food, shelter, clothing, but there’s more to that,” he adds. Going home full-handed, Ralf Daniel is moved to apply the tips on environmental protection through tree planting. At school, he invited his friends and classmates to plant tree seedlings in their village. “Planting tree seedling is important to replace those that have been cut down,” he shares. The kids also planted some vegetables like tomato, camote tops (sweet potato leaves), Chinese cabbage and bitter melons on the empty lots. With the guidance of their teachers, the kids are also committed to clean their backyards every afternoon. World Vision recently turned over hand washing facilities to two public elementary schools in Camarines Norte to promote cleanliness and proper hygiene among students. 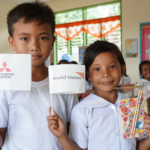 Mitsubishi Motors Philippines donated a 1-classroom building to an elementary school in the municipality of Sta. Rita, Samar.